After departing Dow’s Lake, Lois made up along the canal wall at the Hartwell Lock, the beginning of our transit of canals, lakes, and waterways that will lead us to Kingston. Hartwell Lock is bordered by the lovely campus of Carleton on one side and a park and trail system on the other. I joined Lois too late in the day to follow Art’s recommendation of a visit to the special 1812 exhibits currently on display at the War Museum, but given his favorable impressions and the current mission of the Lois, I’m interested in a return visit to view it and to explore the city of Ottawa at a relaxed pace. At our pre-departure meeting the morning after I arrived, Art explained that construction of the 126-mile Rideau Canal System, designed and overseen by Col. John By, was intended to support Canadian military defenses against possible future invasion by the U.S. Colonel By anticpated the ascendancy of the Age of Steam by pushing for the enlargement of the lock systems already being constructed, in order to accommodate steam vessels. Thus, there are no tow paths along this system. For the most part, the locks are the original ones constructed between 1826-and 1832 and are consistent in design, materials, and dimensions with about a lower width of 33 feet. Lois, with C.L. Churchill on the hip comprises a total width of about 30 feet–close, yes, but manageable. At one point during the afternoon we passed through two very closely positioned concrete piers. Upon approaching them, from my untrained point of view, these were to narrow for us to clear, but Roger, undaunted, dropped us in dead center with (some) room to spare. 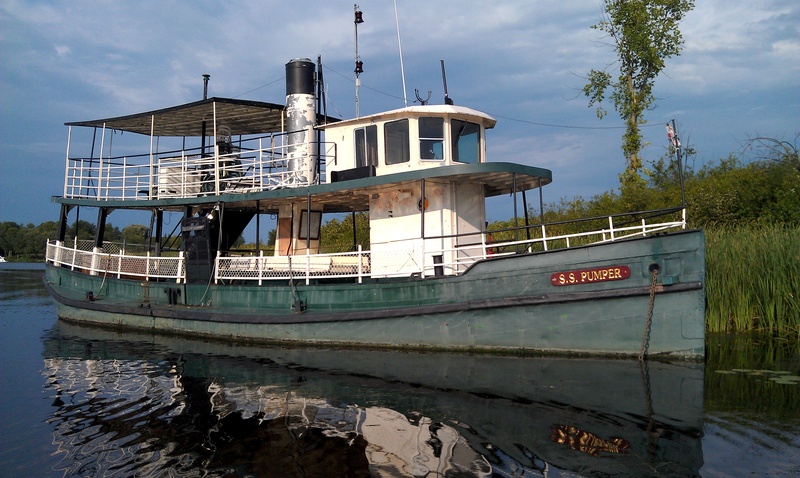 We had a quiet passage to Long Island Marine where we dock for he evening and make a tour of the S.S. Pumper, a 1907 steam powered tour boat. (Jean Belisle explained that, in this instance, “S.S.” signified “Steam Screw”, and not “steam ship” as some of us had presumed.) 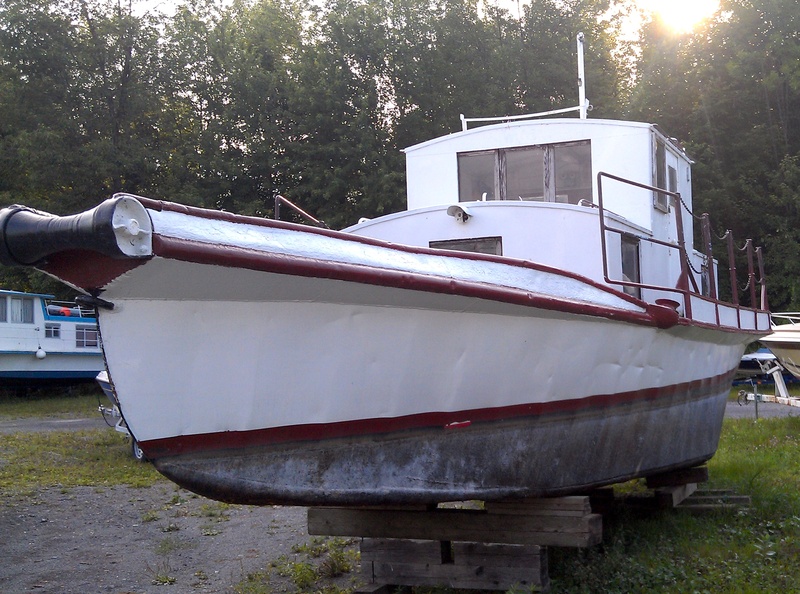 Pumper is aground and, despite evidence of a boiler re-fit, is in need of much work. She must have been a sight when in operation! Whenever boat people stop at a new marina, there is always time spent browsing the yards, taking in all the different vessels docked, moored, or on the hard. While perusing around the marina yard here, we happened upon an unusual craft–a well-worn, diesel powered work boat with a battered steel hull, a massive roller in the bow and heavy protective shroud around the prop. Chris, the yard manager, explained that “Alligator”, as she is called, is a specially designed work boat for use on lakes and waterways in the local logging industry. In addition to its unusual design, “Alligator” has the unique ability to be kedged (hauling herself with an anchor) through the woods from one body of water to another. Once in the water she can be used to “bull” logs and maneuver booms. The following day, we take on Nina Donald, President of the Merrickville Historical Society, who welcomed us and explained that the town was happily awaiting our arrival, that docking and shore side accommodations were in place, and that our crew was invited to attend a reception in a historic waterfront blockhouse. Merrickville is a historic canal side village. We made up along the wall not far from one of the town’s important historic features, the restored blockhouse. The blockhouse was constructed by Col. By in 1832 as a part of the general plan to develop military fortifications along the canal. A number of defensive buildings and blockhoueses were constructed; only 4 blockhouses remain. Below the wall we discovered a display maintained by the town describing local industrial heritage, including brick making, iron foundry, a hames factory, and several furniture manufacturers. Our walk through the center of the village revealed a number of carefully maintained buildings crafted from limestone or brick. We asked Jean why some of the older stone buildings had gable ends that rose above the roof lines by several feet. We wondered if this was simply a flourish added to make the building appear larger. Jean explained that that these actually served an important safety function in that that the raised gable could prevent fire from spreading from one roof to to another. Not only was this a common feature in older buildings (including those found in Old Montreal), but it was a legal requirement to include it. Additionally, these building also contained masonry fire blocks between the floors and metal roofs, again with the intention of preventing the spread of fires. That evening the crew attended the aforementioned reception. Hosted by Ms. Donald, the affair offered the crew a chance to tour the block house and to engage with community members including Mayor Douglas Struthers, the town council, and others. We were grateful for the the town’s gracious welcome and excitement for our presence at Merrickville. We were able to have some time off before we opened, which gave us a chance to see the town. While exploring at a local antique shop, Whistle Post Antiques, Kathleen struck up a conversation with the manager who recommended that she contact a local baker renowned for her pies. Losing no time, Kathleen called the bakers June and Peg directly from the store and made arrangements for the delivery of what turned about to be delicious pies, cookies, lasagna and quiches. Although we obtain local food when it is available, our foraging for usually involves trips to supermarkets, but these locally prepared provisions were a very pleasing exception. We opened the following day, and were overwhelmed with the response. Despite the rain, we saw over 400 people, and had many detailed conversations with locals about the history that built Merrickville into the thriving town it is today. The sense of pride and ownership of the citizens was clear. Stopping at places like Merrickville are a treat for us – beautiful scenery, great people, and a wonderful reception. Thank you for a great stop! A veteran volunteer of the Lake Champlain Maritime Museum, Peter is a teacher in real life. He spends the summers traveling and messing about in boats.